a powerful tractor fitted with caterpillar tracks and a blade at the front, used for moving earth, rocks, etc. A self-propelled earth-moving machine consisting of a caterpillar or wheeled tractor or similar machine with an attached operating member—a curved blade (plate) located outside the base of the machine’s undercarriage. It is utilized for layered digging, leveling, and shifting (for distances of 60-150 m) of earth, minerals, road-construction materials, and other materials for building and repairing roads, canals, and hydraulic-engineering and similar works. 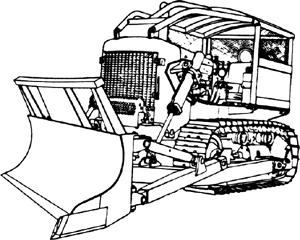 There are several types of bulldozers: those with a fixed blade mounted perpendicular to the longitudinal axis of the basic machine; those with a swiveling blade that can be set at an angle in the horizontal plane on either side of the machine’s longitudinal axis or at right angles to it; and those of the universal type, with a blade having two hinged, articulated halves that can be set in the horizontal plane at various angles to the machine’s longitudinal axis or perpendicular to it (track-layer). The blades of all types are equipped with mechanisms with hydraulic, cable, or electromechanical drives for raising and lowering, swiveling in a plane, tilting in a transverse plane, and inclining forward or backward in the direction of the vehicle’s motion. Bulldozers are supplied with interchangeable equipment (scarifier tines, graders, spreaders, stub-wings, and so on) that broaden their usefulness and increase their efficiency for specific jobs. (2) A bending press for hot or cold machine bending in dies of parts (such as clamps, brackets, and angles) from blanks having various cross sections. The presses are two basic types: crank-operated and hydraulically operated. The bull-dozers most commonly used in forging and stamping production are of the level crank-operated type, with a force of 0.2-5 meganewtons (MN; 20-500 ton-forces) and a rate of 6-20 strokes per minute. High-speed bulldozers with a force of 0.2 MN (20 ton-forces) and a rate of 45-60 strokes per minute are used for the hot bending of blanks with small cross sections. A wheeled or crawler tractor equipped with a reinforced, curved steel plate mounted in front, perpendicular to the ground, for pushing excavated materials. A machine for bending, forging, and punching narrow plates and bars, in which a ram is pushed along a horizontal path by a pair of cranks that are linked to two bullwheels with eccentric pins. A tractor or other prime mover equipped with a blade attached by arms or brackets to its front end; used in pushing or piling earth or rock. The measure would provide a level playing field to all the suppliers of bulldozers in Pakistan and widest possible competition which leads to more choices, higher value for money and since public funds are involved savings to the exchequer. The new Bulldozer XL5000 has an updated packaging and label design. The bulldozer driver will testify behind a screen to protect their identity after the court refused Corrie's parents' request that the family be able to see the soldiers that killed their daughter. The police official blamed the driver of the car for speeding and not paying attention when entering the junction with the bulldozer in front of him. However, Hussein Ghanyem, a lawyer for Dweiyat's family, told Reuters the bulldozer driver suffered from mental illness. Two men were seen to climb on board the bulldozer before an off-duty soldier in a blue T-shirt shot the driver at point blank range to cries of "well done". Witnesses reported a scene of chaos and panic as the bulldozer plowed over cars, knocked over a city bus and damaged buildings on busy Jaffa Road near the city's main bus station. Israeli police said the man was a bulldozer operator who worked in the area for a local construction firm. The Lego Technic Motorized Bulldozer is available in the shops now, but we have FIVE to give away in today's competition. spokesman Richard Wheatley said the bulldozer was not the company's. The fire was mostly restricted to the bulldozer, which malfunctioned in Building 3 at 68 Hopkinton Road, according to Fire Capt. But he must have been behind a mound of rubble when one of the big bulldozers that spreads it out came over and flattened it without even seeing him.